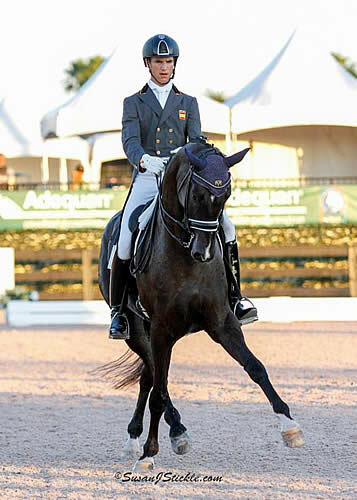 Wellington, FL – March 3, 2019 – Competition on Sunday, March 3, at the Adequan® Global Dressage Festival (AGDF) featured freestyle classes and the conclusion of the seventh annual Florida International Youth Dressage Championships (FIYDC). The 2019 FIYDC featured competition for riders in the Under 25, Young Rider, Junior Rider, Children and Pony divisions, offering them a chance to compete on the big stage in the Global International Arena at AGDF and showcase their talent at one of the world’s largest and most high-profile dressage competitions. This year there were 13 horse and rider pairs in the FEI U25 division, 11 entries in the FEI Young Rider division, six in the FEI Junior Rider Division, one in the FEI Children division, and three in the FEI Pony Rider division. The riders represented four countries, including Canada, Germany, Spain, and the United States. Natalia Bacariza Danguillecourt (ESP), a 17-year-old from Madrid, Spain, was the division winner in both the FEI Young Rider and FEI Junior Rider divisions. Bacariza Danguillecourt rode Dhannie Ymas, a 12-year-old Hanoverian gelding by Don Crusador owned by Yeguada de Ymas in the Young Rider division. The pair earned a score of 72.843% in the FEI Young Rider Team test on Friday, a score of 72.500% in the FEI Young Rider Individual test on Saturday, and a score of 74.742% in the FEI Young Rider Freestyle on Sunday. Natalia Bacariza riding Dhannie Ymas. Photo Credit: ©SusanJStickle. Wellington, FL — March 18, 2018 — The sixth annual Florida International Youth Dressage Championships (FIYDC) were the highlight of competition on the final day of week 10, Sunday, March 18, of the Adequan® Global Dressage Festival (AGDF) at the Palm Beach International Equestrian Center (PBIEC) in Wellington, Florida. The 2018 Florida International Youth Dressage Championships — presented by Terri Kane, Hampton Green Farm, Sarah Davis, USEF Owners’ Dressage Task Force and Dressage 4Kids — took place alongside senior competition in week 10 at the AGDF. It featured competition for riders in the Under-25, Young Rider, Junior, Children and Pony divisions, offering them a chance to compete on the big stage and showcase their talent at one of the world’s largest and most high-profile dressage competitions. There were five youth division winners, with 16-year-old Natalia Bacariza from Spain winning the overall trophy for the highest average score. She beat six other Junior riders, winning all three classes with over 71% on the Yeguada De Ymas’s 11-year-old Don Crusador gelding, Dhannie Ymas — former ride of her trainer Juan Matute Guimon and his kür gold medal-winning 2015 Junior European Championships partner. “I am super happy about winning; I’ve wanted this for a very long time and I’m really happy that we finally did it,” said Bacariza, who is from Madrid and is the daughter of Cristina Danguillecourt and Javier Bacariza, owners of the Yeguada de Ymas. “I’ve been riding Dhannie for three months. He was ridden by Juan before, so he already knows his job, but you still have to ride him and not make any mistakes. Our best test was the individual [71.716%] and I’m very excited about our journey together. It was another win for Spain in the Under-25 division, with Rodrigo Encinas Fuentes and Van The Man leading the field of 10 entrants. The horse is owned by Cesar Parra, who rode the now 16-year-old gelding by Obelisk at grand prix at AGDF in 2013, 2014 and 2015 before handing the reins over to his young pupil. Fuentes won only one of the three young rider tests, with Natalie Pai (USA) winning the other two on Unlimited, but his average score of 68.094% edged out Pai’s 67.746%. “I was very happy with the horse; I felt he was truly with me and gave 100%,” said the 22-year-old Madrid native, who was competing at AGDF for the first time. “There are of course still some things I could improve, as always, but I’m truly happy with his attitude and he’s getting better test after test. It was Canada’s Beatrice Boucher who came out on top of the 17 competitors in the Young Rider division. Riding Gilles Bergeron’s 15-year-old Del Piero gelding Delfiano, she averaged 69.415% across the three tests. The youngest division winner came in the form of 13-year-old Tori Belles from Pennsylvania riding PJ Rizvi’s pony Prince Z to an average score of 67.498%. The final winner was another to hail from Canada. Lily-Rose Lemaire, 14, rode the former broodmare World Lady, 18, to the Children’s title. Jennifer Baumert made it three wins from three starts on Handsome in week 10. PBIEC is a lucky venue for the American duo, who have won a staggering eight classes this season. Baumert posted 75.2% on Elizabeth ‘Betsy’ Juliano’s 13-year-old Hochadel gelding, with fellow American Jodie Kelly-Baxley on Caymus, by Sir Sinclair, slotting in to second (74.175%) and Canada’s Brittany Fraser filling third with Jill Irving’s Sir Donnerhall gelding, Soccer City (72.875%). “He’s awesome,” grinned Baumert. “I was pumped in there because Debbie [McDonald] psyched me up to get him really in front of me and taking every opportunity I could between movements to push him up in front and come into every movement with a lot of power. And we did that! Baumert, who was competing Handsome at the AGDF for the second successive year, usually returns to her Ohio base in April, but is staying on in Wellington this year. Leida Collins-Strijk and Zantros. Photos: ©SusanJStickle. 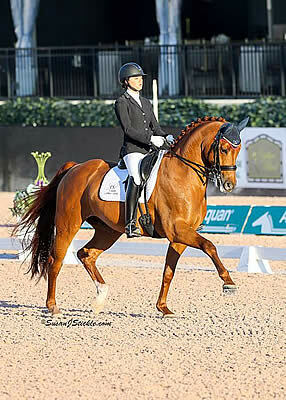 Wellington, FL – March 20, 2016 – Leida Collins-Strijk (NED) and Zantros finished with a win in the FEI Intermediaire I Freestyle CDI 1*, presented by Mike & Roz Collins, on the final day of competition of week ten at the Adequan Global Dressage Festival (AGDF), scoring a 73.250%. Lindsay Kellock (CAN) and Royal Prinz followed in second place with a 72.250%, while Christer Egerstrom (CRC) and Bello Oriente collected third place earning a 70.750%. AGDF will conclude with its final week of competition on March 30 – April 2. “He was very good this week too, just a little bit tired also. It’s the end of the season and they’ve been in the ring a lot at this point. They both really tried this week and I’m proud of them, even though that sparkle may have been off a little bit,” she continued. “It was very cool I thought. It was great and it doesn’t always work out like that, but this time it did and I was very pleased,” she smiled. Four talented individual riders collected championship accolades today at AGDF for their performances in this week’s Florida International Youth Dressage Championships presented by Kim Boyer, the Davis family, the Kane family, and Dressage4Kids, highlighting international dressage riders under the age of 25. “Last year when we came, that was my first international show. This is my second year doing them, and I hope that we will be able to come back next year as well,” she continued. “I’m very thankful to everyone that has given me the opportunity to be here, Dressage4Kids, who own Bobo, and my parents and friends for all of their support,” she added. Gomez Molina and Tarpan Ymas, owned by Yeguada Ymas, is a relatively new pair, as Gomez only took over the ride on the stunning chestnut gelding earlier this season. 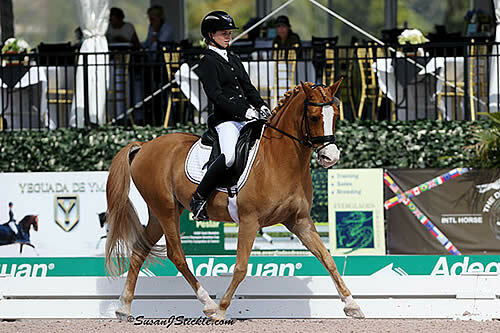 Their performances in the Under 25 division at the Florida International Youth Dressage Championships served as their second CDI competition together and their first championship event at AGDF. “I think right now, it’s about working every day outside of the shows, but also keeping showing and keep going. We’re going to continue learning,” he noted. Mikala Gundersen (DEN) and My Lady, winners of the 2015 FEI Grand Prix Freestyle CDI 4* at AGDF. Photos: ©SusanJStickle. Wellington, FL – March 15, 2016 – The Adequan® Global Dressage Festival (AGDF) welcomes back international competition this week to Palm Beach International Equestrian Center (PBIEC) as the facility prepares to host the AGDF 10 CDI 4* presented by Havensafe Farm, CDI 3* presented by The Dutta Corporation, and CDI 1* presented by Mike & Roz Collins. The 2016 Florida International Youth Dressage Championships, presented by the Davis family, Kim Boyer, Dressage 4 Kids, and the Kane Family, will run in conjunction with the CDI 4*/3*/1* competition throughout the week, allowing top young riders the opportunity to compete in a major international setting at AGDF. Competition will begin tomorrow, Wednesday, March 16, and continue through Sunday, March 20. The AGDF 10 “Friday Night Stars” FEI Grand Prix Freestyle CDI 4*, presented by Havensafe Farm, will begin at 7:00 p.m. on Friday, March 18. The CDI 4* will begin Wednesday, March 16, as the FEI Grand Prix presented by Havensafe Farm will commence in The Stadium at PBIEC promptly at 3:00 p.m. The FEI Prix St. Georges CDI 1*, presented by Mike & Roz Collins, will begin at 8:00 a.m. prior to Grand Prix competition on March 16. The FEI CDI 3* presented by The Dutta Corporation will begin on Thursday, March 17, at 1:25 p.m. with the FEI Grand Prix, preceded by the FEI Intermediaire I, presented by Mike & Roz Collins. Both FEI Grand Prix Freestyle CDI 4*/3* classes are set to take place on Friday, March 18, with the FEI Grand Prix Freestyle CDI 3* scheduled to finish just before the start of the popular “Friday Night Stars” FEI Grand Prix Freestyle under the lights at 7:00 p.m. The FEI Grand Prix Special CDI 4*/3* classes will highlight competition on Saturday, March 19, beginning at 11:00 a.m., with the FEI Intermediaire I Freestyle CDI 1* concluding competition on Sunday, March 20. In one of the largest international competitions ever hosted outside of Europe, more than 140 FEI entries jogged before the judging panel on Tuesday afternoon. The 2016 season at AGDF has developed into one of the most competitive dressage destinations in the world. The event this week will focus not only on the accomplishments of professionals and amateur riders, but also young competitors excelling in the sport, as the largest group of entries was submitted for the 2016 Florida International Youth Dressage Championships. Showcasing riders in the Under 25, Young Rider, Junior, and Pony divisions, the 2016 Florida International Youth Dressage Championships offer a growing platform for young riders wishing to compete at the international levels of the sport, bringing them to the forefront of one of the world’s largest dressage competitions. As the sport continues to expand as an equestrian discipline around the world and entry numbers for the competition continue to increase this year, a massive FEI Young Rider division will highlight the week, boasting 24 entries, the largest Young Rider division in the history of AGDF. Competitors from around the globe are set to take to The Stadium at PBIEC representing nations from North America, South America, and Europe. In the four FEI divisions offered to riders competing in the Florida International Youth Dressage Championships this year, there are great numbers of competitors expected to compete, including: two competitors in the FEI Pony Rider division, eleven riders in the FEI Junior Rider division, 24 entries in the FEI Young Rider division, and eight combinations contesting the FEI Intermediaire II 16-25 division. Top-ranked U.S. rider Barbara “Bebe” Davis, currently ranked 7th in the FEI Young Rider World Rankings list, will compete two mounts, Feivel Mousekewitz, owned by Michael Davis, in the FEI Young Rider division, and Equestricon’s Carrera, owned by Antonia Arl, in the FEI Intermediaire II 16-25 division. Juan Matute Jr. (ESP) who has dominated in both the Large Tour and Small Tour classes at AGDF this season, will compete Dhannie Ymas, owned by Yeguada de Ymas S.L., in the FEI Young Rider division as well, looking to add another win to his already successful campaign this season. Felicitas Hendrix (GER), currently ranked #3 in the world on the FEI Junior Rider list on Faible AS, will also compete, while Diana Porsche (AUT), ranked third on the Under 25 FEI World Rankings list, will compete in both the FEI Young Rider division and FEI Intermediaire 16-25 division aboard Porsche’s Eloy and Di Sandro. This is the fourth year the Florida International Youth Dressage Championships will be hosted by AGDF and the competition is organized by Equestrian Sport Productions. For more information on the Adequan® Global Dressage Festival (AGDF), the 2016 Florida International Youth Dressage Championships, and competition this week, please visit www.globaldressagefestival.com. Tanya Strasser-Shostak and Action Tyme. Photos © SusanJStickle.com. Wellington, FL – February 22, 2014 – CDI 3* competition continued at the Adequan Global Dressage Festival (AGDF) on Saturday with the FEI Grand Prix Special, presented by Stillpoint Farm, and the FEI Intermediaire-1, presented by Peacock Ridge. In addition to professional competition, the sport’s brightest young stars were recognized in the Florida International Youth Dressage Championships, presented by Dressage4Kids, to wrap up the evening. Competition for the AGDF 7 CDIO/CDI 3* concludes on Sunday with the FEI Intermediaire-1 Freestyle and FEI Grand Prix Freestyle, beginning at approximately 10:15 a.m. at The Stadium at PBIEC. Tanya Strasser-Shostak, 18, was crowned Overall Champion of the Florida International Youth Dressage Championships, presented by Dressage4Kids, for her total high score of 136.403% in the FEI Young Rider division with her own Action Tyme, a 14-year-old Oldenburg gelding. Action Tyme has been the perfect schoolmaster for Strasser-Shostak after spending plenty of time in the Grand Prix ring with Strasser-Shostak’s mother, Evi Strasser. “[He’s taught me] so much. I’m so lucky that one day he can let me do the grand prix stuff, the next day we can go back to Young Riders, and the next day we can go hacking. Nothing fazes him, so he’s taught me everything,” Strasser-Shostak remarked. Strasser-Shostak, who has competed at the AGDF since its inception in 2012, credited her experience at the show as a large part of her success. “There’s so many things that we can’t as young riders normally have, with the big rings, the atmosphere. It’s just nice that we can have this experience here. It’s very convenient, and the facility is great,” Strasser-Shostak commented. Katrina Sadis, 15, was champion of the FEI Pony division, finishing with an overall score of 133.992% aboard Poldy 10, an 18-year-old German Riding Pony gelding owned by Kristen Verhey. Sadis is currently enrolled in Dressage4Kids’ Winter Intensive Training (WIT) program with trainer Lendon Grey. “WIT is amazing. Lendon’s a really amazing instructor. It’s so great because we learn so much more than just riding. We have lectures from different people, and it’s such a great experience,” Sadis explained. Champion of the FEI Junior division was Bebe Davis and her horse Fievel Mousekewitz for their score of 134.029%. Fievel Mouskewitz is a 13-year-old Hanoverian gelding owned by Apex Stables International. Davis, 16, had the ride on Sadis’ mount last year in the pony divisions and was happy to see him take another rider to the winner’s circle. “It’s any rider’s dream to be able to see their horse going well with a new rider and still out there winning, being his usual wonderful self. It’s great to see him here in Florida. She’s having a great time with him and they’re getting great scores, and I couldn’t ask for anything better for him,” Davis smiled. Davis’ winning mount is still relatively new to her, but she’s enjoying the process of getting to know the gelding. “It’s going really well. He won today and he was second on Thursday, so I couldn’t be happier. We’re just improving, and our partnership is getting better. He’s just such a fun horse. I couldn’t ask for a better horse,” she described. Like her fellow young riders, Davis has figured out a way to continue her education while remaining competitive on the show circuit. She currently attends Palm Beach International Academy (PBIA), where she has enjoyed the unique experience of having all-equestrian classmates. Her teachers have started to get the equestrian bug as well. “I’ve been with them for the past two years, and they’ve started to follow dressage now. My teachers are really interested in it, which is really cool. It’s a great experience. It’s a lot of fun,” Davis smiled. Melanie Montagano took home the Brentina Trophy for her victory in the FEI Intermediaire B 16-25, presented by Diamante Farms. 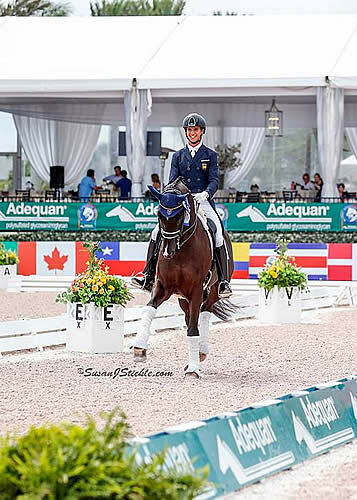 Montagano finished on a 116.06% aboard Ga Deva, her own 14-year-old Dutch Warmblood mare. Montagano recently earned her USDF Gold Medal with Ga Deva, which prompted her to reflect on their seven year journey together. Montagano currently trains with grand prix rider Jacqueline Brooks (CAN) and credited her trainer with much of their success, describing her program as doing “complete wonders” for her riding. Competing each weekend of the AGDF under Brooks’ tutelage has been an important ingredient to her progress. Montagano, 23, recently graduated from the University of Delaware with a pre-veterinary degree. While she has decided to delay applying to veterinary school for the time being, she strongly believes in the value of getting an education. “I’m a big believer in education. It’s a vital part of any successful rider. To be able to connect with people on a different level beyond horses [is really important],” Montagano expressed. Karin Pavicic (CAN) and Don Daiquiri, a 12-year-old Oldenburg gelding co-owned by Jayne Essig and Pavicic, picked up their second win of the week in the FEI Grand Prix Special on Saturday afternoon. The pair topped the class with a score of 70.000%. American Laura Graves rode her own Verdades to second place, finishing with a score of 68.706%. Jill Irving (CAN) completed the top three with Degas 12 and a score of 68.667%. Pavicic was hoping to reach 70% with Saturday’s test and was very excited to have achieved that benchmark. “That’s what I was hoping for and I met my goal. I’m so thrilled. I couldn’t be happier with my horse. I love my horse, he was fantastic,” Pavicic beamed. Pavicic was pleased to see Don Daiquiri come out of the barn a little fresher than the previous day after carefully managing his warm-up time in the Florida heat. After an over-rotated canter pirouette on Friday, Pavicic was happy to improve on that portion of the test in particular. “The pirouette to the one tempis to the pirouette is difficult, one of the more challenging parts of the test, and I feel we rode that quite well today. I over-rotated on my first canter pirouette yesterday, and that almost happened again today, but I caught it in time and was able to ride the one tempis out. I thought my second pirouette was especially good. In general, he was just super obedient and super rideable,” Pavicic commented. Pavicic traveled to the AGDF all the way from Vancouver and was incredibly grateful to have her best friend, Carmen Barber, by her side in Wellington. Pavicic’s family has been following along via livestream, but she acknowledged it’s been difficult to be away from them. Her double victories this week have made the hardship worth it. Saturday was the first time contesting the FEI Grand Prix Special for second place finisher Graves and her mount Verdades. She’s owned the gelding since he was just six months old and was thrilled with their performance. “It’s been almost 12 years that I’ve had him. It’s been a really long road for us. Obviously, we really have a great partnership. I would even call it co-dependent! It’s nice to reach this point and to have success,” Graves explained. Graves’ greatest priority in the test was simply to make sure she stayed on course, making her second place finish in good company even more meaningful. “I’m just glad that we got through it. I was really proud that we did our pirouettes to the one (tempis) clean and another pirouette. He’s an incredibly emotional horse, so to hit something difficult where things happen really fast for him and he kept his cool, I was really proud of him for that. That’s been a real ‘proud mommy’ moment for me,” Graves smiled. Lisa Wilcox (USA) and Galant, an eight-year-old Belgian Warmblood gelding owned by Jacqueline Shear, topped the FEI Intermediaire-1 on Saturday morning with a score of 69.649%. Second place went to Neve Myburgh (GER) and Lexington Star for their score of 68.421%. Catherine Malone (USA) rounded out the top three with Uno Don Diego and a score of 66.798%. 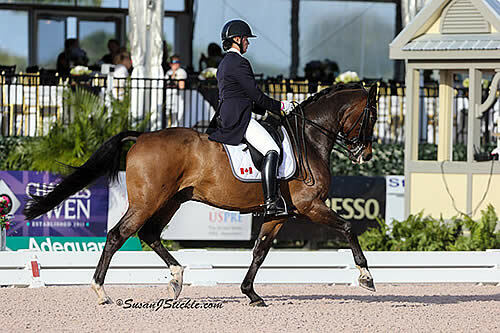 Wilcox was surprised to see that Galant was actually spookier during the daytime after competing under the lights of The Stadium earlier week for the FEI Prix St. Georges. For Wilcox, the highlight of their test was their canter work. After a small bobble in the extended trot that Wilcox acknowledged was her fault, she was pleased with Galant’s solid canter zig-zags and pirouettes. Like Wilcox, Myburgh acknowledged her horse was actually more lit up during the day time competition, but she was pleased that Lexington Star also held it together despite being relatively inexperienced. “He’s only been doing Prix St. Georges and I-1 for the last three months and this is his second CDI, so I’m really happy with him. He’s a generally very spooky horse, so hats off to him for getting past the flowerpots!” Myburgh smiled. Myburgh is still getting to know the gelding; she’s only had the ride for the last five months. She looks forward to getting his owner back on at some point in the future, but will also continue to compete him herself as their relationship continues to develop. Kim Boyer, Lendon Gray, and Michael Davis present an award to one of last year’s YDC winners, Julie McKean. Photo © SusanJStickle.com. Wellington, FL – February 13, 2014 – Week seven of the 2014 Adequan Global Dressage Festival (AGDF) will feature the Florida International Youth Dressage Championships (YDC), presented by Dressage4Kids. The Championships start on Friday morning, comprising four divisions – Pony, Junior, Young Rider, and Under 25 Grand Prix. Additional sponsors of the event include PanaCavallo/The Davis Family, Hampton Green Farm, and Dressage Today magazine. The event will take place during AGDF’s Stillpoint Farm CDIO Nations Cup and CDI 3* presented by Peacock Ridge, which runs February 19-23 at The Stadium at The Palm Beach International Equestrian Center (PBIEC). The 2014 YDC are open to all nationalities and riders under 25. No matter what country they are from, all are encouraged to sign up and participate! In addition to the competition, there will be many fun events throughout the week. 2014 is the second year of the YDC, and the first year that the Championships will be held in the International Classes. Holding the YDC during the Nations Cup will expose American-based youth riders to the international flavor of a large European show. Awards of $3,000 will be divided among the top riders in each division, and Hampton Green Farm will award the use of one stall at their facility in Wellington for the 2015 season to the overall highest placed rider in each division based on their combined scores of the two required tests. All parents and owners of horses in the YDC are invited to a reception hosted by the Dressage Owners Task Force, Tuesday afternoon after the CDIO Nations Cup jog, in the Global Pavilion at The Stadium at PBIEC from 4:00-6:00 p.m. The Seminar for youth riders and their trainers will be held on Wednesday from 3:00-4:15 p.m. at The Wellington Club on the Main Grounds at PBIEC (FTI WEF show grounds) and is sponsored by Equestrian Sport Productions, Adequan, and Dr. Rob van Wessum. The speakers are Dr. Rob van Wessum and Dr. Torri Maxwell of Adequan. Dr. Maxwell will be lecturing on joint health, and Dr. van Wessum will be speaking about Training for Soundness. Dr. van Wessum joined the practice of Don Ryker, DVM & Associates in 2009 as a specialist in equine lameness. In addition to 17 years of clinical experience as a sport horse lameness clinician, he has experience as an internationally known rider, trainer, and judge in the sport of dressage. A native of the Netherlands, he received his veterinary degree from Utrect University in 1991. A special dinner is also scheduled for Thursday evening at Diamante Farms with support from Dressage Today magazine, hosted by Terri and Devon Kane and Michael and Sarah Davis, from 6:30-9:00 p.m. All area youth riders and their guests (trainers, parents) are invited. For more information on the Florida International Youth Dressage Championships, please visit www.globaldressagefestival.com.